The Boulders Resort provides their guests with many activities and amenities for children, families, and adults. 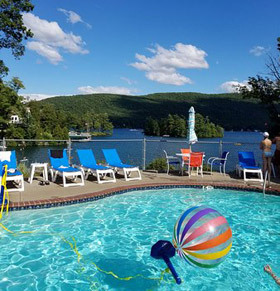 Our pool and hot tub area is a great place to relax, exercise, and enjoy the spectacular views of the lake. For those of you who would like to explore the lake hop on one of our free rowboats, paddleboards, paddleboats, canoes, or kayaks. The playground and free play gameroom will keep the kids occupied for hours. Feel free to use the ping pong table, shuffleboard, basketball, badminton, volleyball and the horseshoe pit. The Boulders Resort invites everyone to free cookouts with hotdogs, hamburgers, chips, and drinks every Thursday at 1:00 PM (weather permitting - summer dates only). Local Activities: Saratoga Racetrack& Racino, The Great Escape/ Splashwater Kingdom, Waterslide World, Adventure Racing/ Go Kart Track-Game Room, Extreme Sports Zip Line Challenge, Natural Stone Bridge and Caves, Fort William Henry, Lake George Cruise Ships, Para Sailing, Scuba Diving, Snorkeling, Sailing, Boating, Canoeing, Whitewater Rafting, Fishing, Scenic Drives, Hikes, Bicycling, Bowling, Roller Skating, Golfing, Hunting, Antiquing, Shopping, Outlet Stores Galore, Festivals, Museums, Dining, and much more! Internet Marketing Services and Hosting by Mannix Marketing Inc.